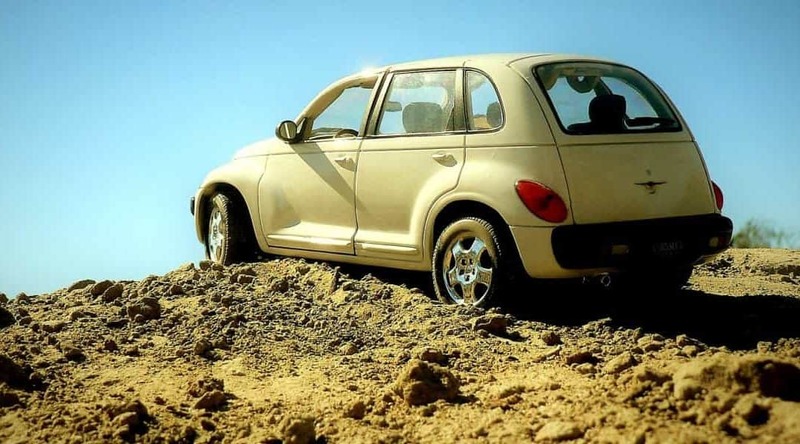 Ideally, if you could drive your car to wherever you are going it would be better. You would save money on airfare, and you wouldn’t have to worry about driving a rental car. Plus, you would have the familiarity of driving your own car. But not all trips allow for a long leisurely drive. Sometimes you have to fly and if you have a family, that means you need to rent a car. The problem with car rentals is that they can get expensive quickly. Here are the sites we use to save money on a rental car when we are traveling. *I’ll be using a real trip to give you the best idea of how the price can vary from site to site. We were looking for a full size car for the luggage space. Every person I’ve spoken to on and offline tells me their first stop for travel and car rentals is Costco’s travel site. I checked out Costco and their rates for a full size rental car served as our baseline. The price here is $1,650 US which is equivalent to $2,123 Canadian (the rest of the rates will be in Canadian, but the savings still apply)! FYI, this is close to what we paid for our flights, so finding a cheaper car rental was a must in my mind. This is my go-to site for everything relating to discount travel. We have been using it for hotels for over 10 years and the rates we get are incredible. Lately, it’s been a great place to save money on a rental car too. We have also booked our rental cars at a fraction of the price if we had booked directly from the rental agency. The way it works is that you don’t know the car company until you book your rental. In the past, one of the car rental companies we got through Hotwire was Sixt.com and working with its service was great. However, for this trip, I found Hotwire prices to be higher than usual. Total price was $1,629. I just heard of SkyScanner.com this week in our Thriving Families group on Facebook (thanks again to Elle from Couple Money for sharing this with the group). It’s a site that scans all of the different sites to find you the best rates all in one place. Looking at its rates, they were less than Hotwire but not the clear cut winner that I hoped it would be this time. This is my first time using Car Rental 8.com. I found it through Hotwire as one of its suggested sites. The rates it had for our trip were quite a bit less than every other site. That is what we ended up booking. The challenge with this site is, like Hotwire, you don’t know the company you are booking with until you pay. That is how it is able to offer you these low prices. I figured, since it was in the terminal, and it mentions the brands it works with, that we were in good hands. Plus, it had a cancellation policy should I decide that this doesn’t work for our situation. As you can see, we saved BIG on our car rental. 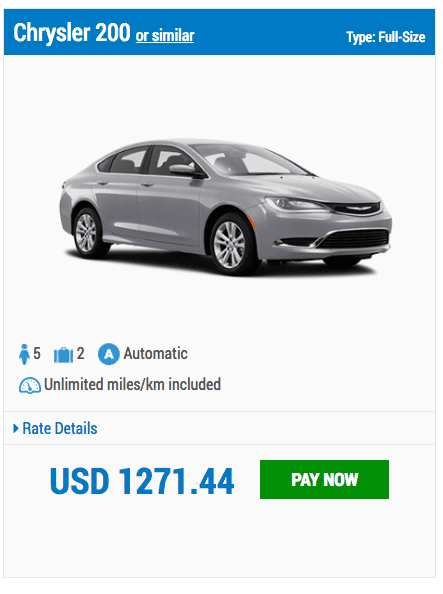 Car Rental 8.com was over $400 from the next cheapest option and half of what some other sites were offering. The car rental agency ended up being Thrifty Car Rentals. What About Directly Booking With Thrifty? Of course whenever you get a good deal, the first thing to do is check the actual site to make sure you saved money. 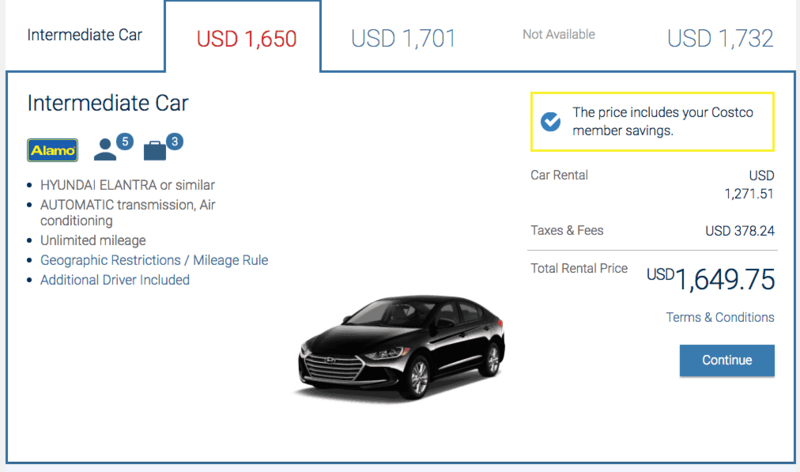 I went to the Thrifty Car Rental site and the price of the car was $1,271.44 USD (or $1,632.78 CAD). Use an Incognito window of your browser when you are shopping online to double check you are getting the best rate. Cookies on your browser can “help” these sites and have them raise rates on you without you ever knowing. Getting insurance through the rental agency can get pretty costly. Check with your current insurance provider to see if you can get better rates before you get down to your rental agency. Ours is usually 50% less than if we go with the rental agencies insurance. Check out Esurance to see if their rental insurance works for you. 2. Open a second tab and check SkyScanner.com. 3. 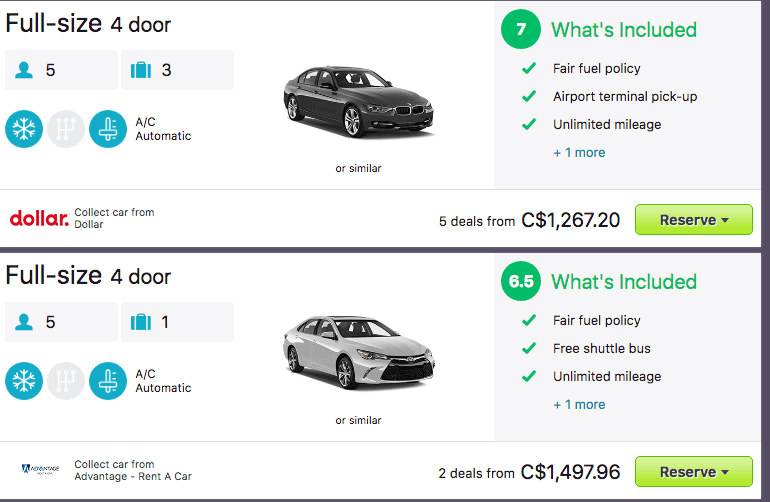 Use the recommended sites on Hotwire.com to see if there are any better prices (this is how we found Car Rental 8). 4. Check out Car Rental 8.com to see if you can find a better rate. 5. 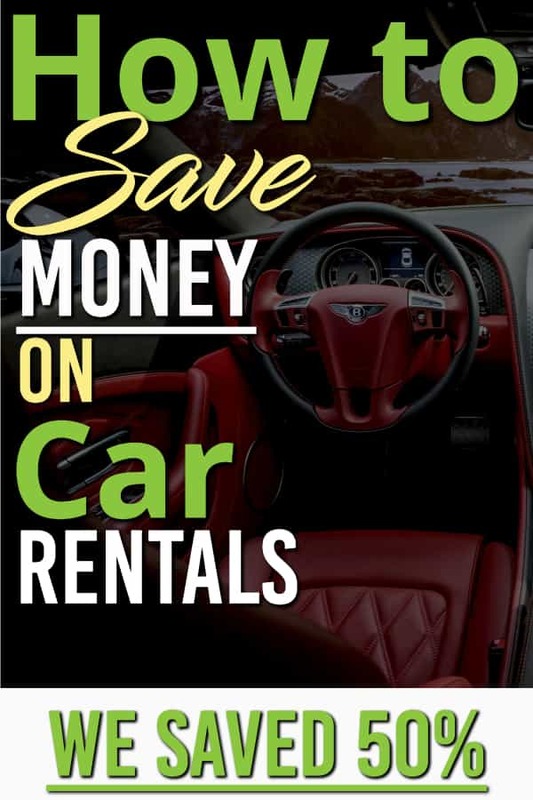 Book your car rental with the best rate. 6. Check out Esurance ( or your own insurance provider) to see how much car rental insurance will cost you. Like what you read? Share it and help others save money! 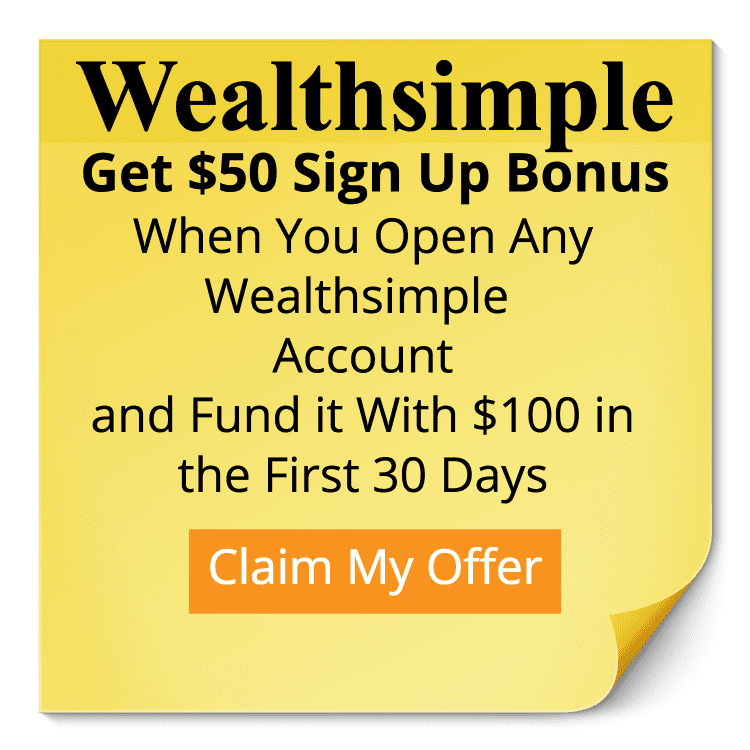 Great tips – shopping around online is wise, I’ve been amazed at the variety of prices I can find online. I also do the incognito browsers so the sites don’t track me. One other tip to save money is knowing that many travel credit cards actually offer quality car rental insurance for free. With that in mind, I always decline the insurance to save some money…my credit card will kick in in the event of an accident. Definitely read up on your credit card to see what they offer but it could be a no-brainer way to save money.